What is the difference between a Peavey and a Cant Hook? Traditionally cant hooks were used around sawmills for turning cants. While peaveys were designed for and used for river drives. Both tools consist of a handle with a swing hook. The difference between the two is what is on the end of the handle and the way the tools grip a log. A cant hook has a small toe hook on the end which provides a second biting edge. 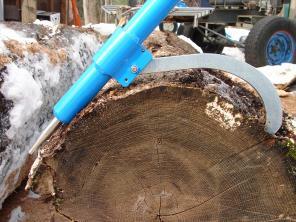 A peavey has a point on the end which is used to separate logs. Today these tools are used interchangeably and are capable of doing the same jobs. So it comes down to personal preference when choosing between the two tools. We have noticed regional preferences. Gets a better grip on the log. Can be stuck between logs to free them. Point can be stuck in ground to stand the tool up making it easy to find. Our log arches are the most effective, ergonomic and useful tools for low impact forestry, arborist and portable sawmill applications. Log arches allow for low impact operations in sensitive areas, minimal ground disturbance and clean logs for portable sawmilling. These log arches are proprietary products in production since 1996. Originally manufactured for Future Forestry Products, Inc. and now manufactured and distributed by LogRite Tools. LogRite continues to lead the industry for design and development of state of the art, progressive equipment for selective harvesting, thinning, log and material handling for forest land owners, arborists and sawyers. We can move any log, anywhere, any size and on any slope. These accessories for our arches will help you expand the way you use your arch. Hookaroons are great tools for reaching into or across machines to clear a jam or move cants and logs. These tools extend your reach or keep your hands out of harms way. 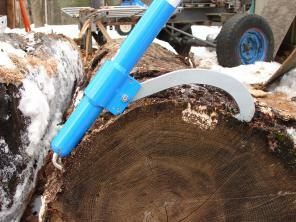 They can also be used for moving slabs or firewood quickly. Now with a barbed chisel point for an even better bite! 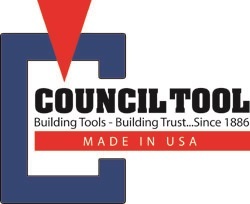 Logrite is proud to sell Council Tool's line of axes because the founders of both companies share similar beliefs and beginnings. John Picket Council, like Kevin, began making tools because he was dissatisfied with the quality of tools available for purchase. Word spread about the value of the tools he handcrafted, and he subsequently found himself selling tools. The business was incorporated in 1886, and it's been manufacturing hand tools of one type or another ever since. Both John and Kevin believe that manufacturing a quality product, continuing to be innovative and being honest are keys to a company's success. For well over a century, Council Tool has forged millions of axes; all of them 100% Made in the USA. "Made in the USA" is a phrase that is particularly meaningful. This means just what it says at Council Tool. We use only American steel in our forgings, American hickory in our handles, and we use domestic material and supplies. Before we attach a "Made in the USA" label, we make sure ours is a quality product in every respect, that it measures up to our own standards, and that it is a product that will represent excellent value for the user. Council Tool uses a variety of forging methods to produce their tools. Forging is simply striking hot metal with a hammer into a desired shape. The advantage to forging is that it improves the strength of the metal by aligning and stretching the grain structure. A forged part will be stronger than a casting or a machines part. Before you buy a tool, ask if it is forged. Council Tools are. TruckClaws™ are a patent-pending, all-season truck traction aid to help drivers get unstuck, saving them time and the expense of tow truck services. Simple to use and easy to install, TruckClaws™ feature a traction cleat that attaches to a drive tire on the rear of a vehicle with a customized reinforced strap and heavy-duty ratchet. It takes less than 60 seconds to install each claw. The devices can free a truck stuck in mud, snow, ice and sand and may be installed over chains. There are two models of this product, TruckClaws™ and TruckClaws™ II. TruckClaws™ are designed for commercial trucks that carry loads up to 80,000 lbs. Depending on weight and road conditions, two or four devices are installed on the truck’s drive tires. Each claw can be installed in less than 60 seconds, and each kit weighs less than 16 lbs., making them easy to stow behind the seat or in a side box. TruckClaws™ II are a smaller version designed for SUVs and four-wheel drive trucks. Under extreme conditions, the effectiveness of TruckClaws™ II can be enhanced with an optional extender bar to extend the claw’s width and traction force creating a total of 16" of enhanced traction. More Tools for your lumber, log and firewood moving needs. We offer replacement parts - just in case something should wear out. The world's best penetrant! Creeps in where others can't. Penetrates through dirt, varnish, grease and rust. Bluecreeper is a multipurpose synthetic lubricant. It is designed to penetrate and lubricate to Get Stuff Moving! It's low viscosity won't attract dirt and debris making it the ideal lubricant for sewing machines, clippers, trimmers, chains, locks and precision instruments of all kinds. 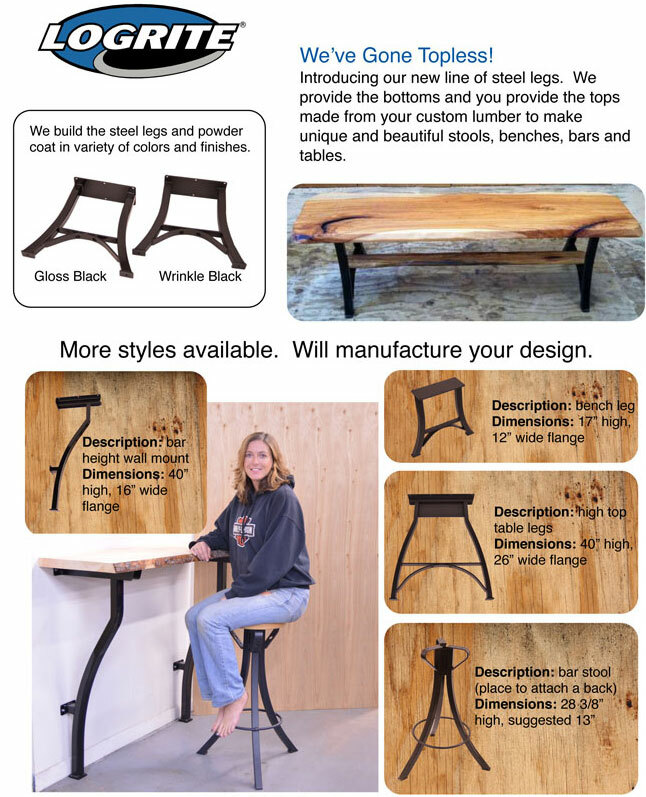 The Rite Leg Company Website is now open! Click to visit! Fun items with the Logrite logo.